A little bit About Us – Modus Cleaning Solutions are based in Handsacre and operate for domestic and commercial customers in Lichfield, Tamworth, Rugeley, Sutton Coldfield and all surrounding Staffordshire villages. Our aim is to provide our customers with a first class external (and carpet!) cleaning service. Our sensible pricing policy ensures best value for all. We have grown and developed from a gutter cleaning service to a specialist cleaning solutions company to meet the needs of our clients. We now offer a wide range of cleaning solutions including window cleaning, conservatory cleaning, pressure/jet washing of external areas including driveway and patio cleaning and sealing, gutter, fascia and soffit cleaning, wall and cladding cleaning as well as carpet cleaning. We really are your one stop shop for external building cleaning services in Staffordshire. This has been achieved by investing heavily in new equipment as well as ensuring that all staff have the appropriate training and accreditations. We have gained IPAF accreditation to safely hire and use cherry pickers for working at height and have also completed a Clean Smart Carpet Technicians course. 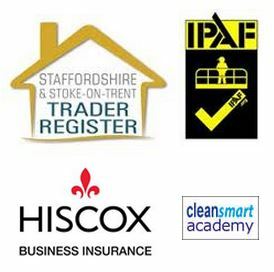 Modus Cleaning Solutions are one of a select group of businesses to have been awarded membership of the Staffordshire and Stoke-On-Trent Trader Register. This scheme ensures that all of our customers can be confident of high standards of workmanship, safe systems of work and of course full insurance. We also offer a 7 day no questions asked cancellation policy, all with the backing of Staffordshire Trading Standards for complete peace of mind.